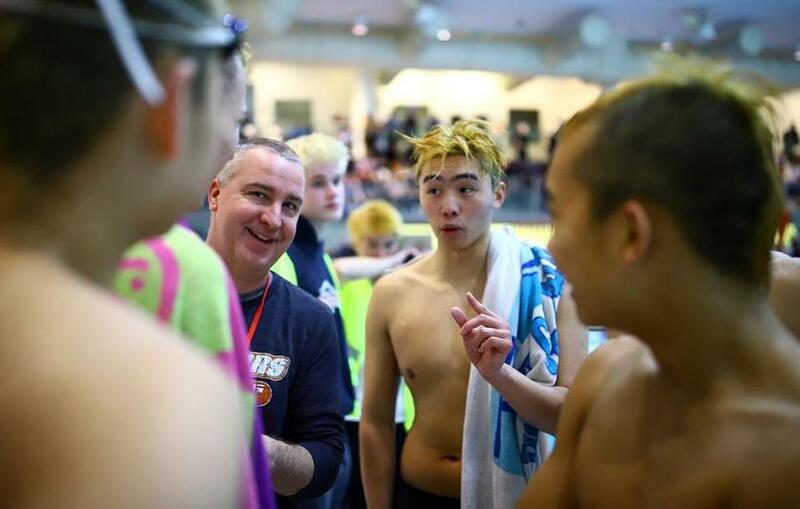 Wayland&apos;s Jiming Xu took first in the 100-yard breaststroke, helping the Warriors win their second straight North sectional boys&apos; swimming and diving championship. 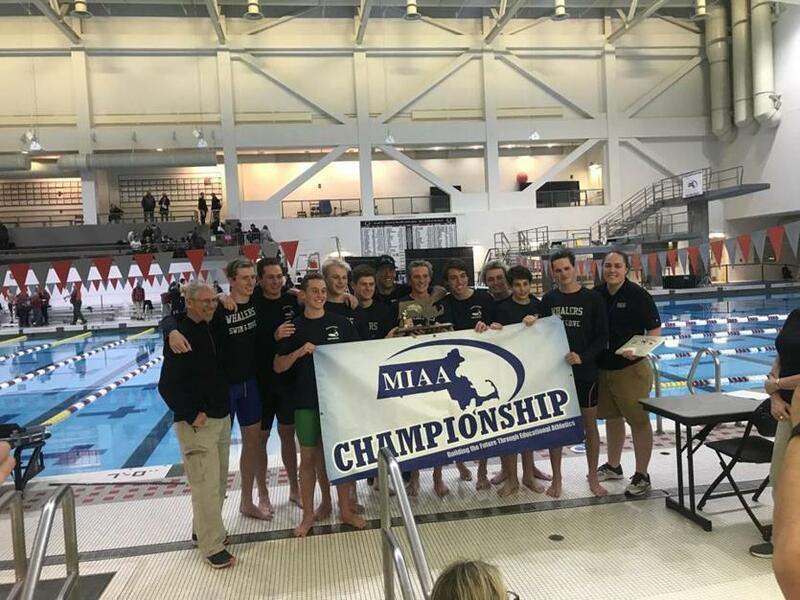 From the very first event of the MIAA North boys’ swimming & diving championships Sunday, St. John’s Prep and defending champion Wayland were competing for the top spot at MIT’s Zesiger Center pool in Cambridge. In the 200-yard medley relay, Wayland’s foursome of senior Daniel Nee, sophomore Jiming Xu, senior Andy Brogan, and senior Nick Smith edged Prep’s quartet of senior Mitch Lockwood, junior Palmer Randall, sophomore Andrew Coady, and sophomore Kai Zola, by 0.51 seconds — 1:37.23 to 1.37.74. Lockwood was a double solo winner, placing first in the 50-yard and 100-yard freestyle, as well as anchoring the Eagles’ first-place relay team in the 400 freestyle. But Wayland pulled away to repeat as North champion, piling up 356 points to outdistance Prep (263), and win the second sectional title in program history. 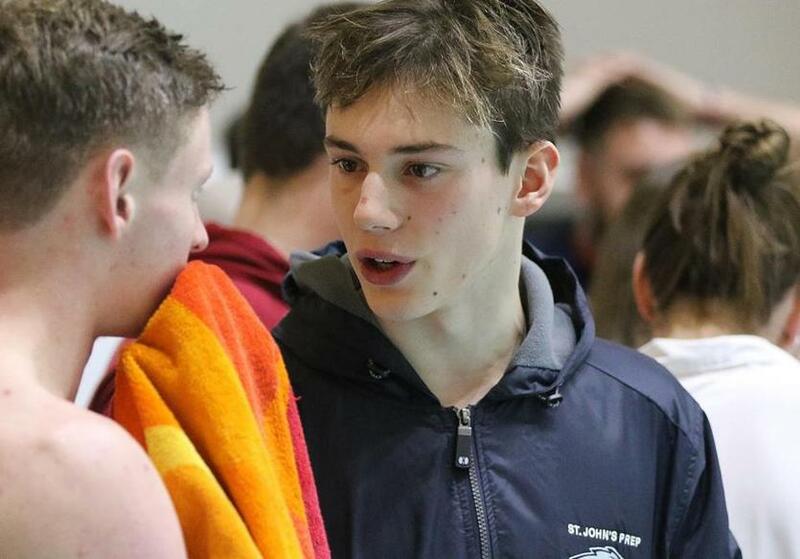 “We look forward to getting through the 50 free, because you know if just a couple things are off, the times are going to be pretty significant and you’ll slide way down, so when we got through the 50 we felt good,” said Wayland coach Mike Foley. Despite winning, Wayland finished first in just three events: the 200-yard medley relay and the 200-yard freestyle relay, and the 100-yard breaststroke. Wayland coach Mike Foley couldn’t be happier that his team approach worked so well. “[Depth] is the whole key for us at this point and all season long it has been. 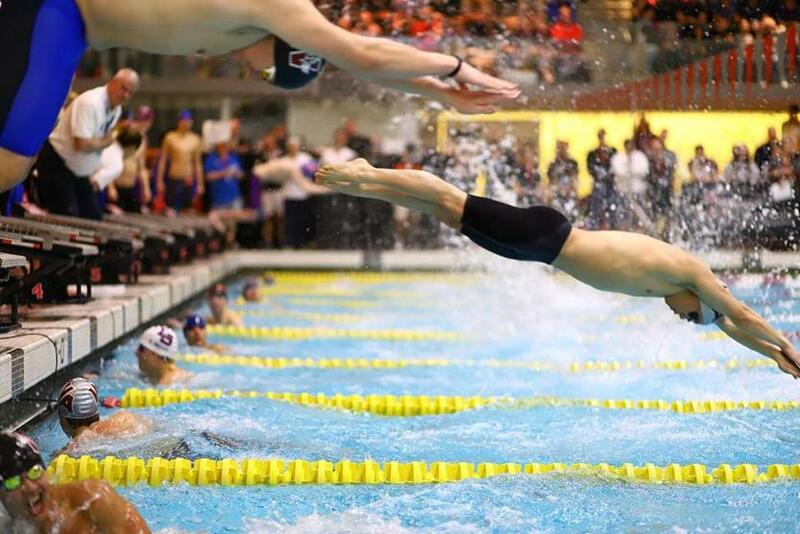 We have some good swimmers, but we pride ourselves in being able to get fifth, eighth, 12th, and not outscoring the teams with one phenomenal guy,” said Foley. Sophomore Jiming Xu was the only individual winner for Wayland, placing first in the 100-yard breaststroke in 58.61 seconds. Smith was the anchor of both first-place relay teams, as well as placing second in the 50 free and third in the 100 freestyle. “We were really pumped coming in because there were a lot of doubters, so we really wanted to prove everyone wrong. We did lose a couple pieces last year, but we came in ready to go and we got it done,” said Xu. Wayland will look to repeat as Division 2 state champion on Sunday at Boston University. Nantucket’s swimming team celebrates the South sectional championship. Nantucket brought home the school’s first South sectional title in any sport, winning with 228 points, topping Natick (213). The Whalers dominated the entire meet, placing first in five events. Natucket junior Tyler Roethke was the meet’s only double winner, placing first in the 200 freestyle and the 500 freestyle. Despite not having a single individual finish first in the meet, Natick held onto second because of its depth as the Redhawks notched seven top-five finishes. Natick sophomore Antonio Arena and Roethke were side by side for the final leg of the night’s last contest, the 400-yard relay. Roethke took the lead and secured the win for Nantucket. “The guys did phenomenal. We had a lot of best times from a lot of guys. They swam their hardest and I couldn’t ask for better,” said Natick coach Caitlyn Shaddock, as the Redhawks placed second at the sectionals for the second straight year in yet another nailbiter. The Redhawks came up just short in the final race against Needham last season. From the first race on, the Whalers sat atop the team results and never let up. “It feels amazing. When the site sheets came out on Tuesday, we knew we had a big job ahead of us, and we just had to come out here and execute,” said Whaler coach Jim Pignato. Pignato saved his highest praise for Roethke. “It’s a huge team effort to be able to win this meet. Led by Tyler, not just today, but he leads us in his work ethic and his dedication in and out of the pool,” Pignato said. As well as being the only double winner and the anchor to Nantucket’s winning 400-medley relay team, Roethke was also the anchor of the winning 200-yard medley relay, the first event of the night. “I owe it to all my teammates and coaches, and everyone that’s helped us. I mean I didn’t do it, the whole team did it. Everyone scored and everyone stepped it up,” said Roethke. “This is just sectionals too, states is next weekend so, we still got a lot more left in the tank. Swimmers compete at the MIAA North boys' swimming and diving championships at MIT's Zesiger Center pool. 200 medley relay — 1. Wayland, 1:37.23; 2. St. John’s Prep, 1:37.74; 3. Mystic Valley, 1:41.03. 200 freestyle — 1. Scott Spear, Reading, 1:42.42; 2. Kevin Ochoa, Malden, 1:44.82; 3. Aaron Zhu, Chelmsford, 1:46.1. 200 individual medley — 1. Antonio Anastasiades, Lynnfield, 1:57.49; 2. Edmond Giang, Wayland, 1:58.9; 3. Benjamin Cote, Chelmsford, 1:59.09. 50 freestyle — 1. Mitchell Lockwood, St. John’s Prep, 0:21.45; 2. Nick Smith, Wayland, 0:21.9; 3. Armen Abrahamian, Wayland, . St. John’s Prep swimmer Mitchell Lockwood took first in the 50-yard and the 100-yard freestyle. Diving — 1. Dale Nickerson, Weston, 602.250 points; 2. Charlie Reichle, Concord-Carlisle, 542.500; 3. Hunter Whitbeck, Acton-Boxborough, 507.850. 100 butterfly — 1. Jake Williams, Mystic Valley, 0:51.95; 2. Kevin Ochoa, Malden, 0:52; 3. Edmond Giang, Wayland, 0:52.58. 100 freestyle — 1. Mitchell Lockwood, St. John’s Prep, 0:46.97; 2. Alex Zhang, Acton-Boxborough, 0:48.69; 3. Nick Smith, Wayland, 0:49.05. 500 freestyle — 1. Scott Spear, Reading, 4:43.04; 2. Daniel Vasquez, Central Catholic, 4:48.65; 3. Ben Guzovsky, Weston, 4:48.89. 200 freestyle relay — 1. Wayland, 1:28.91; 2. St. John’s Prep, 1:29.95; 3. Chelmsford, 1:30.48. 100 backstroke — 1. Aaron Zhu, Chelmsford, 0:52.85; 2. Daniel Nee, Wayland, 0:53.57; 3. Anthony Xue, Wayland, 0:54.08. 100 breaststroke — 1. Jiming Xu, Wayland, 0:58.61; 2. Antonio Anastasiades, Lynnfield, 0:59.59; 3. Pablo Kohlmann-Garcia, Winchester, 0:59.88. 400 freestyle relay — 1. St. John’s Prep, 3:17.8; 2. Chelmsford, 3:19.6; 3. Lincoln-Sudbury, 3:21.49. Team results — 1. Wayland, 356; 2. St. John’s Prep, 263; 3. Westford, 167.5; 4. Chelmsford, 165; 5. Acton-Boxborough, 143; 6. Weston, 140; 7. Lincoln-Sudbury, 121.5; 8. Newton South, 120; 9. Andover, 117; 10. Mystic Valley, 108. 200 medley relay — 1. Nantucket, 1:38.66; 2. Natick, 1:42.73; 3. Bishop Feehan, 1:42.91. 200 freestyle — 1. Tyler Roethke, Nantucket, 1:42.55; 2. Ben Schmeimer, Natick, 1:45.77; 3. Alex Pecze, Ashland, 1:45.82. 200 individual medley — 1. Henry Keegan, Needham, 1:56.79; 2. Erik Watka, Bishop Feehan, 1:57.88; 3. Kyle Gray, Oliver Ames, 1:58.9. 50 freestyle — 1. Blake Anderson, Seekonk, 0:22.09; 2. Daniel Scherrer, Wellesley, 0:22.14; 3. Antonio Arena, Natick, 0:22.34. Diving — 1. John R Byers, Newton North, 364.900 points; 2. Matt Herdegen, BC High, 356.900; 3. Zack Lawrence, Dover-Sherborn, 307.550. 100 butterfly — 1. Grant Beebe, Nantucket, 51:47; 2. Jacob Cuoco, Old Rochester, 52:26; 3. Henry Keegan, Needham, 53:44. 100 freestyle — 1. Kyle Gray, Oliver Ames, 48:11; 2. Charles Nascimben, Catholic Memorial, 48:35; 3. Ben Schmeimer, Natick, 48:58. 500 freestyle — 1. Tyler Roethke, Nantucket, 4:39; 2. Tyler Stringfellow, King Philip, 4:42; 3. Dean Spicer, Cohasset, 4:45. 200 freestyle relay — 1. Needham, 1:31; 2. Natick, 1:32.01; 3. Ashland, 1:32.27. 100 backstroke — 1. Alex Pecze, Ashland, 53:12; 2. James Taaffe, Nantucket, 54:12; 3. Chance Yan, Framingham, 54:25. 100 breaststroke — 1. Tyler Stringfellow, King Philip, 0:59.65; 2. Charles Nascimben, Catholic Memorial, 0:59.74; 3. Jonathan Qian, Newton North, 1:04. 400 freestyle relay — 1. Nantucket, 3:16; 2. Natick, 3:17; 3. Needham, 3:22. Team results — 1. Nantucket, 228; 2. Natick, 213; 3. Needham, 195.5; 4. Ashland, 167; 5. Bishop Feehan, 151; 6. King Philip, 137; 7. Wellesley, 124; 8. BC High, 107; 9. Oliver Ames, 98.5; 10. Framingham, 94.